Dream adventures come to life through a surrealistic tour of the Argentine Tango in this annual student production and fundraiser, conceived and directed by Debbie Goodwin. You will meet the “sneak thief” in pursuit of the tango fairy; the wannabe artist who dreams of dancing off with his muse, the accordion-playing hobo who imagines winning the affections of the gorgeous society lady, two friends who are lost in nostalgia for the romantic days gone by when they danced the tango in Milongas all over town. Pamela Shreeve, the Tango Fairy with Michele Richards, the Sneak Thief. Mark Anderson, street musician, and Tanja Obear, his object of desire. Focus is on intricate footwork in Pretty Feet. Choreographed by Debbie Goodwin, Rose Vierling and John Campbell, and danced by 18 members of the Marin Argentine Tango community, Tango Dreamscapes also features musical numbers from dancers William Zemsky on guitar, Mark Anderson on accordion and Christianna Valentina, a professional vocalist/pianist. Ms. Valentina will be partnered by John Campbell, a professional dancer and co-founder of Alma del Tango. • When: Friday and Saturday, Feb. 13 and 14 at 7:00 & 8:30 p.m. Sunday, Feb. 15, 2 & 3:30 p.m.
• Tickets: In advance $20 general seating; $25 premium. Available at almadeltango.org. Or call 800-838-3006. $25 and $30 at the door, if available. • Proceeds will benefit Alma del Tango, a Marin-based non-profit dedicated to encouraging artistic expression and the development of community through Argentine Tango. An accomplished tango dancer/choreographer and teacher living in Marin, Ms. Goodwin has immersed herself in Argentine Tango culture for the past 18 years. Tango Dreamscapes is rooted in her ethnological research of tango communities, the topic of her master’s project in dance from CSU Sacramento, and her continued interest in the profound effects tango plays in the lives of those who enter into this culture. along with guest artists, debuted in February 2014. Tango Magic explores the magical moments of the dance … that unspoken connection between partners, the music and the movement. Conceived and directed by Debbie Goodwin with choreography by Ms. Goodwin and Rose Vierling; script by Lanny Udell and Jonathan Cutler. When: Sunday, May 4, 2 p.m. – Sold out! Limited seating: only 50 tickets available. A second performance will take place at 3:30 p.m. with tickets at $25 and $20. Proceeds will benefit Alma del Tango, a Marin-based non-profit dedicated to encouraging artistic expression and the development of community through Argentine Tango. Enter the captivating world of the Argentine Tango. In this introductory class with instructor Rose Vierling of Alma del Tango Studio, you will begin to learn to move like a tanguero(a); to embrace and walk the Argentine way; and to navigate the social dance floor. You’ll even practice the particularities of Argentine Tango etiquette. Partners are welcome, but not necessary. Please wear leather or suede sole shoes. When: Tuesday, April 29, 7:30 – 8:30 p.m.
Click here for a full schedule of Alma del Tango classes and events. (San Anselmo, CA, April 1) The Marin tango community comes together in support of one of its own at a fundraiser to benefit the Alex Levin Recovery Fund. Levin, a San Rafael resident, was struck by a car while traveling in Vladivostok and remains in critical condition in a Russian hospital. When: Friday, April 5. Class by Debbie Goodwin & John Campell (levels 2-4) at 7 pm. Dancing 8-11 pm. DJ Ashvin Iyer. Ticket price: $15 minimum donation. All proceeds go to the Alex Levin Fund. Jessica Lewin, a friend of Levin and his wife Karina, will match all donations during the evening benefit dollar for dollar, up to $1,000. • Two tickets to El Arrabal for the May 4 milonga. 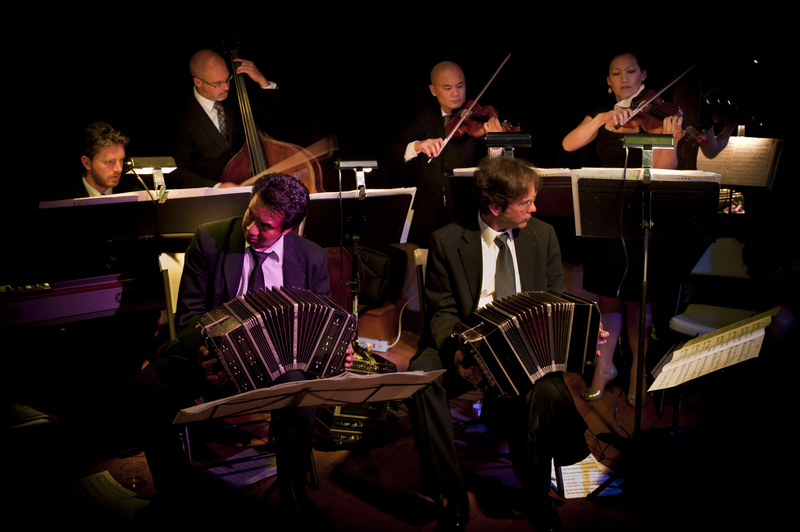 Includes a 1 ½ hour workshop with Eduardo Saucedo, the milonga with music by Seth Asarnow y Su Sexteto Tipico, and a table for two with a bottle of champagne. From Steve & JoAnn Palubinskas & Adolfo Caszarry. • Alexander Technique lesson for tango dancers, from Janet Lott. Alex & Karina Levin, one of Marin’s favorite tango couples, are a joy to watch and a dream to dance with. Born in Russia, Alex and Karina emigrated to the U.S. in 1995. In 1999, they read a newspaper article about Argentine Tango and their passion for the dance was ignited. They began taking lessons, first with John Campbell and other leading Bay Area instructors. Then they made two trips to Buenos Aires to study the classic milonguero style as danced in the salons of central Buenos Aires. 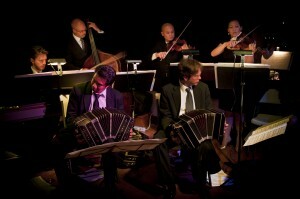 This style stresses the improvisational nature of tango and the connection between partners. Alex and Karina enjoy social dancing with emphasis on musicality. “We just love it,” says Karina. In addition to frequenting the milongas, the couple has been known to play a diSarli CD and dance in their kitchen. Here, Alex & Karina dance in a featured piece in Tango Tales 2012 produced by Alma del Tango. 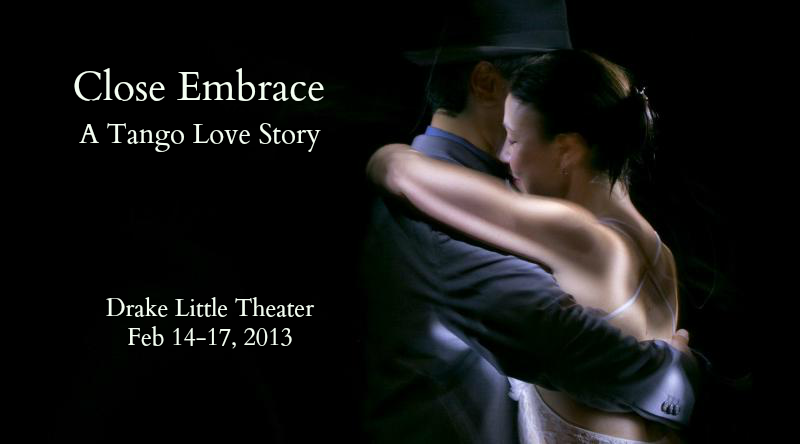 While most of us are in the midst of shopping for the Holidays, Alma del Tango is in the middle of preparing for their next Tango production: “Close Embrace, A Tango Love Story”. The production follows the story of a romance fiction writer who is working on a novel about a woman’s journey through love, heartbreak and healing. Her character travels to Buenos Aires to immerse herself in tango and leave the drama of her break up behind.” (Doesn’t this sounds familiar?) The story is written by Lanny Udell & Jonathan Cutler and directed and choreographed by Debbie Goodwin. Tanya Rohklin and Jose Orellana, regular students at Alma del Tango, play the lead roles. Guest artists include a few of our favorite local dancers and teachers: Daniel Peters, David Caditz and Rose Vierling. Debbie Goodwin and John Campbell will also make an appearance. This is sure to be a treat. Alma del Tango is a non-profit organization started by Debbie Goodwin and John Campbell in 1996. The organization is dedicated to encouraging artistic expression and the development of community through Argentine Tango. Quite fittingly, “Alma del Tango” translates to heart or soul of Tango. Debbie and John, along with putting on an annual student dance production, teach beginner to advanced classes plus host a weekly practica and a monthly milonga, all in Marin County, California. Alma del Tango is also the umbrella organization for several note worthy Tango projects such as “TangoCalifia” that hosts milongas in public locations around San Francisco, the all-women Tango group, “Tango Con*Fusión” and most recently “Seth Asarnow y Su Sexteto Tipico“, one of the Bay Area’s most popular Tango orchestras. I highly recommend visiting their website for more information on all of Alma del Tango’s activities. Plus, on the site they post video clips from their advanced classes demonstrating very fun patterns. Seth Asarnow y Su Sexteto Tipico. One of the things I like most about Alma del Tango, is that through their annual student dance productions they offer dancers the opportunity to perform, greatly increasing their confidence and skills. One cannot help but improve with regular practice and a focused goal. Performing on a stage can be quite frightening, but for those who attempt it, it’s a life changing experience. These tango productions are also a great way to educate the larger community about Argentine Tango and perhaps even inspire a few people to try it themselves. If you have not seen one of their productions yet, or cant’ wait to see another one, take advantage of the special pre-Sale Ticket rate of only $15 happening until December 15th. Tip: The Valentines Day show makes for a great date. Pre-Sale Tickets: $15 until December 15th. Click here to purchase discounted ticktets now!